We (K-Nine and Mog) are parked at Momotombo on Lago de Managua in Nicaragua. There are several volcanoes nearby and the sand is black. So that we can park right on the lake shore (N 12.404932 W 86.609967) we agreed to eat and drink in the adjacent cafe (under the trees on the left). Three fish meals, one chicken meal plus six local beers comes to $20 USA. The proprietor lies on a double bed in front of the bar with one foot in the air. When conscious, his job is to needlessly re-direct the staff. His authority is only slightly diminished by the pig under his bed. The several dogs wandering around the cafe add to the atmosphere created by the small boy running around carrying a big branch with a green parrot perched on one end. Whilst the chairs are plastic, the tables appear to be the result of a competition to make as many tables as possible (using only a chain saw, hammer and 6 inch nails) in 10 minutes. An elaborate chrome and plastic ghetto-blaster demonstrates the impossibility of producing 300 watts of undistorted sound from a device costing less than $50 USA. For a brief moment the power fails, plunging everybody into darkness, and mercifully killing the sound system, but alas, only temporarily. When we first arrived, we decided to ingratiate ourselves by immediately ordering a beer. The waitress agreed they did indeed have cerveza and offered us a choice of brands. We asked for the best. 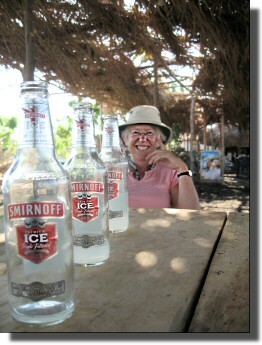 She returned with four open Smirnoff Ice. Ann enjoyed hers, muttering something about her daughters and her "street credibility". Still we did not come to Momotombo for fine gourmet dinning. We came, as I expect you have already guessed, to see the WHS (well you should know by now) of León Viejo. Old León, founded in 1524, was the Spanish Colonial capital of the area. You might think that a relatively modern city destroyed by an earthquake, abandoned and subsequently covered in volcanic ash for a couple of hundred years would not rival the Mayan cities we have already seen in Central America. Indeed you might think it would only be of interest to serious students of Spanish Colonial architecture. You would be right. 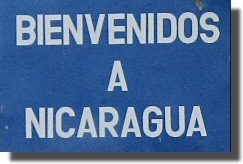 Although the guided tour was in Spanish, most of the signs were also in English. Perhaps the most interesting sign was for Ana Jimenez's House (the remains of the "house" itself were not interesting). The sign said. Important Data: During the development of the city it was a small and discreet lodge used by the women of important people that were passing by the city. The proprietor was very welcoming and agreed we could stay the night for $6 USA per van. This included access to the shower of one of the rooms. Several aspects of the motel were unusual (at least to us). Each room had a car port with a curtain that shielded the car from other patrons. Our room was equipped with a type of exercise equipment not found in most gymnasia and the room rates were for periods of two hours. Because the border crossing from Honduras to Nicaragua seemed more than usually disorganized, we employed a guide (well two actually, one to get us out of Honduras and one to get us into Nicaragua). As a result we were thru the border in less than two hours. Whilst the guides do take you to the right rooms/counters they also invent spurious charges. For example our guide invented a Nicaraguan "road tax" that evaporated when we insisted on a receipt. We are in Masaya having crossed into Nicaragua last Saturday. We spent last night at the volcano (Masaya National Park) and tonight will stay either in Grenada or here, still looking for deck chairs.